Can We Please Talk About Marian Rivera's Michael Cinco Gown? Because she looks like a princess! Marian Rivera, ikaw na talaga! The bride just walked down the aisle in a custom Michael Cinco ecru gown made out of French lace and studded Swarovski crystals, which reportedly cost about P2 million (via Inquirer.net). She looked like a Disney princess, you guys! Check out her dramatic entrance at the Immaculate Conception Cathedral in Cubao. The off-shoulder gown, which has a tight bodice and a flowy skirt, fit Marian's 5'2 frame perfectly. The actress put her hair up in a chic bun and accessorized with a mother of pearl crown—designed by Michael himself. If you think the gown looks amazing from the front, you have to see it from the back. Michael isn't the only local designer involved in the #DongYan nuptials. Randy Ortiz made Dingdong's white tuxedo, while Michael Leyva designed the bridesmaids' red gowns. Joey Samson and Ivarluski Aseron made the outfits of the secondary sponsors, while Paul Cabral styled the couple's parents. 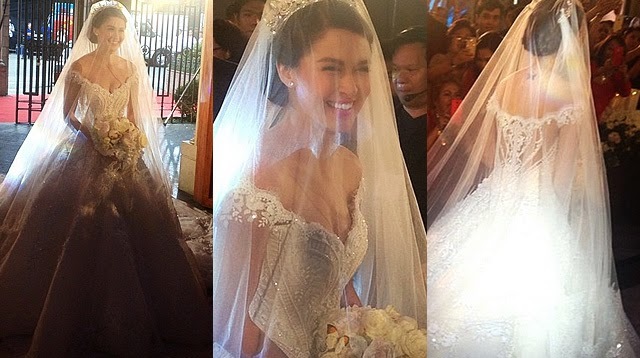 We Have #DongYan Wedding Updates!